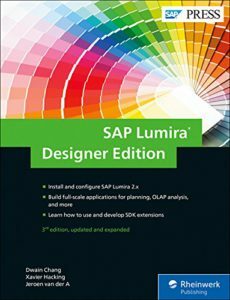 HackingSAP.com » SAP Lumira, Designer edition – The Comprehensive Guide (SAP Press) now available! I am new to SAP world. I use other BI tools though. I bought SAP Lumira Designer Editon. What we have is Lumira Designer 2.2 version. The samples and examples provided has link to SAP BW. I cannot use them for reference or run them locally. Where can I learn scripting. Designing layout is not very clear in this book or I am not getting it. Any suggestion in this regard would be great help. Thank you! You can also follow the examples using HANA views. Chapter 6 gives a walkthrough of the tool. Scripting is explained in chapter 8.